Derek Carr continued a stunning trend of quarterback play this season in Week 4. Peyton Manning set the NFL record for passing yards with 5,477 back in 2013. After one month this season, Jared Goff, Ben Roethlisberger, Kirk Cousins and Derek Carr(!) are on pace to break that record. In a game when Drew Brees didn&apos;t throw a touchdown and NFL leading receiver Michael Thomas was limited to four catches, the New Orleans Saints won with other options - Alvin Kamara and a defense that didn&apos;t live up to its much-maligned status. Kamara ran for three second-half touchdowns, Wil Lutz matched his career high with four field goals and the Saints&apos; defense shut down the New York Giants after giving up an early touchdown in a 33-18 win on Sunday. "This was a complete game, everything came together," said Kamara, who ran for 134 yards and scored on runs of 9, 4 and 49 yards. This is getting to look familiar to New York Giants fans. With Odell Beckham Jr., healthy, rookie Saquon Barkley in the backfield, Sterling Shepard emerging as a complementary target, the Giants&apos; offense should be far more dangerous than in last season&apos;s debacle. The Saints didn&apos;t even need Drew Brees to be his usual dominating self because, after New York&apos;s superb opening drive, the offense pretty much went silent until it was too late. From the moment they identified him as the quarterback to lift their struggling franchise, the Chicago Bears envisioned big games from Mitchell Trubisky. Trubisky threw a career-high six touchdown passes - one shy of the NFL record - and the NFC North-leading Bears pounded the Tampa Bay Buccaneers 48-10 on Sunday. The Bears (3-1) won their third straight with Trubisky delivering the sort of performance general manager Ryan Pace envisioned when he traded up a spot to draft the prized quarterback with the No. 2 overall pick last year. From the moment they identified him as the quarterback to lift their struggling franchise, the Chicago Bears envisioned big games from Mitchell Trubisky. Trubisky threw a career-high six touchdown passes — one shy of the NFL record — and the NFC North-leading Bears pounded the Tampa Bay Buccaneers 48-10 on Sunday. 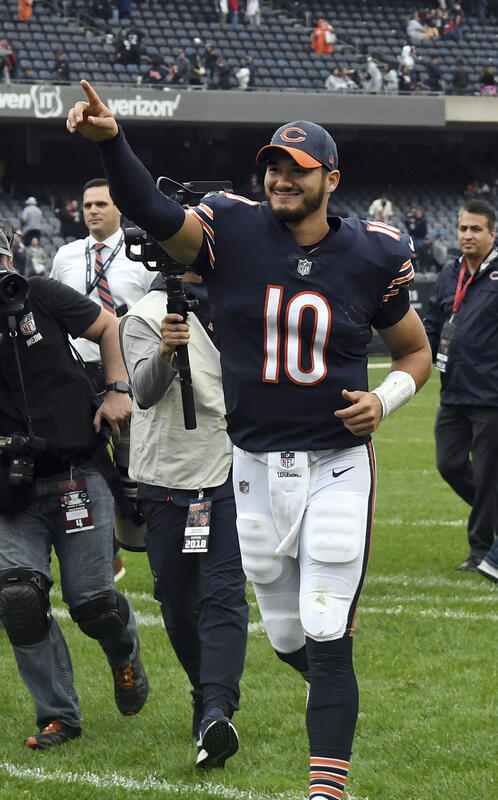 The Bears (3-1) won their third straight with Trubisky delivering the sort of performance general manager Ryan Pace envisioned when he traded up a spot to draft the prized quarterback with the No. 2 overall pick last year. Leonard Fournette&apos;s return to the field did not last long. The 23-year-old running back re-injured his hamstring and left the Jacksonville Jaguars&apos; matchup with the New York Jets in the first half on Sunday. Fournette originally hurt his hamstring in Jacksonville&apos;s season-opening 20-15 win against the New York Giants, before missing the team&apos;s next two games with the injury. The New York Giants&apos; reconstructed offensive line will face its second consecutive stern test when the New Orleans Saints visit MetLife Stadium on Sunday. The Saints (2-1) feature one of the NFL&apos;s premier defensive ends in Cameron Jordan, who is tied for the league lead with four sacks. The primary job of blocking him will go to Chad Wheeler, a second-year tackle who went undrafted out of Southern California.